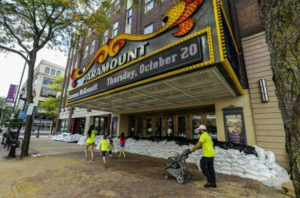 If you read our article last month about the spectacular Paramount Theatre in Cedar Rapids and how it was given a new life after the historic Great Flood of 2008, you already know how much the people of Cedar Rapids love the theater and the superhuman effort they made to restore it after an almost certain end in that devastating flood. The Great Flood of 2008 set a record flood level in downtown of 31.12 feet – 19 feet above major flood stage and the highest level ever recorded for the Cedar River. That flood decimated the city, and it took six years of incredible effort and expense, almost solely borne by the people of Cedar Rapids, to bring their jewel of a city back from that historic disaster. But there’s more to the story of floodwaters in Cedar Rapids and the Paramount Theatre, and that is where this article begins. Festival Director Dan Holzman and I visited Cedar Rapids in early September of last year to meet with all our partners and contacts in the city and make plans for the festival activities. As usual, the city was sparkling clean, and we enjoyed walking around downtown to get to all our appointments and seeing how lovely and convenient everything will be for our festival this summer. Just a few weeks later, however, more than a week of heavy rains in the Midwest again threatened Cedar Rapids with floodwaters. BySeptember 19th, city officials were standing by to implement flood protection measures, fearing the worst as forecasters predicted another record flood stage. As forecasters predicted higher and higher flood crests, the citizens in Cedar Rapids and those of us watching from a distance feared that the Cedar River would again try to ruin the city – and thereby eliminate any chance of our festival being held there this summer. But the people of Cedar Rapids weren’t going to give in to the floodwaters without putting up a tremendous fight. By Tuesday, September 20th, city leaders mobilized the carefully-designed plans they had prepared after the Great Flood of 2008, and along with hundreds of city workers, contractors and thousands of citizen volunteers from the region and across the state, they began an around-the-clock effort to protect the city from destruction. Installed 17 miles of HESCO flood barriers along the most vulnerable riverfront on both sides of the river downtown, filling them with 20 million pounds of sand. Filled by hand and deployed some 400,000 sandbags as a second line of defense inside the HESCO barriers, along the perimeters of buildings and city infrastructure, in case the flood waters overtopped the 2-meter high HESCO walls. Moved 60,000 books and other assets from the ground floor of the beautiful new Main Library in downtown, relocating them to the third floor. Deployed emergency pumps and response teams along the flood barriers, monitoring the emergency flood protection they had built. And, remembering what a near-fatal blow the city-owned Paramount Theatre suffered in the Great Flood of 2008, the city put out a call for volunteers to help remove seats and other fixtures from the main level of the historic theater and carry them up to the balcony level where floodwaters could not reach, even if the flood broke through the barriers and sandbags and flooded into the theater again. The citizens of Cedar Rapids responded, along with a swarm of professional carpenters from Local 308 of the Carpenter’s Union in Cedar Rapids. Remembering all the work Local members had done to restore the theater after the Great Flood of 2008, the Local and their brothers and sisters from other Carpenters Union locals across the state of Iowa rallied to the call to help save what they could in the Paramount Theatre, even if they could not stop the river itself. “We got a lot of work in this building, and when the call came to protect it, we responded,” Local 308 President Bob Doubek said. Helped by citizen volunteers and theater crews, the carpenters removed 880 main-floor seats to the balcony level, along with historic 90-year old seating end caps. “Anything that was portable at all has been moved from the basement and the main floor,” said Jason Anderson, Paramount’s general manager. They even disconnected the mighty Wurlitzer pipe organ that was so heavily damaged in the flood of 2008, and moved it out of the theater to safer higher ground outside the city. After the flood of 2008, the Wurlitzer was found upside-down on the opposite side of the stage, having been submerged by floodwaters for more than a week. Cedar Rapidians didn’t want that precious instrument to suffer again. After everything that could be moved from the basement and main levels had been moved, crews installed a backup emergency generator in the basement to power the theater’s sump pump and air conditioning system, so that when the city cut off grid power, pumps could keep seeping water from rising through the basement level, and keep humidity levels down to avoid damaging all the beautiful fabrics, carpeting, tile and paint in the building. “We feel that the Paramount is kind of the city’s crown jewel, but I think this proves it,” Anderson said. Then, over the weekend, with all possible flood protection measures in place, the people of Cedar Rapids could do nothing more than watch and wait as the river reached its crest. But city crews, utility workers, all emergency responders and more than 400 Iowa National Guardsmen kept a 24-hour-a-day watch over the city, monitoring the protections they had put in place, ready to respond if the barriers failed or were overtopped by the raging river. We watched the daily webcasts each morning from Cedar Rapids as city leaders and others involved in the flood response held a live news conference from downtown. It was truly inspiring to see such an incredible team of dedicated, capable people working so hard to keep Nature at bay and protect the city they so clearly loved. By Sunday night, September 25th, water in the Cedar River was pouring through the city at the rate of 110,000,000 gallons per minute – more than 35 times the normal rate of 3,000,000 gallons per minute – and increasing at 5-7% per hour. Forecasters had been slowly lowering their crest predictions for the flood, down from an initial call of 25 feet to an eventual crest at 23 feet – still 7 feet above major flood stage and still on track to be the 2nd-worst flood in the city’s history. Thousands of residents and businesses had been evacuated from the flood zone, and the city had cut electrical and gas service inside the area most threatened if the flood barriers failed. Downtown was quiet and empty, except for a few guests and staff in the DoubleTree Hotel, which remained open throughout the emergency. Everyone watched and waited. The river crested Monday night at 21.97 feet – down 2.5 feet from the initial crest predictions, and safely below the levels of the HESCO barriers. Throughout the night and all day Tuesday, the raging waters slowly receded. By midday Wednesday, the height of the threat had passed, and the river began returning to its banks. The barriers had held back the river. The people of Cedar Rapids had saved their city. There were no major breaches along the 17 miles of emergency flood barriers. Minor breaches were handled almost instantly by city crews, Iowa Guardsmen and contractors using dump trucks of dirt, sand, sandbags and emergency pumps, all standing watch inside the “dry zone” 24/7 since Saturday afternoon. The U.S. Cellular Center and DoubleTree Hotel – our juggling space and our festival HQ hotel – stayed dry. The priceless and spectacular Paramount Theatre – our venue for stage shows and championships – stayed dry. The few trickles of water that seeped into the basement sumps were so small that they were picked up by a household Shop-Vac. On Saturday, dozens of carpenters and citizen volunteers quickly responded to the call to re-install all the fixtures they had removed in advance of the flood. A show scheduled in the Paramount Theatre for that night went on as planned. Most of the NewBo/Czech Village dining and shopping area near our juggling venues were also kept dry, as was the city’s gleaming new Main Library, the beautiful Green Square Park, and all other new city facilities built since the 2008 flood. The incredible community response and teamwork of the people of this great city accomplished an astounding feat in planning and building a vast system of temporary flood barriers in just three days, and it did its job. Six thousand homes and businesses were evacuated peacefully; there was no looting or unrest and, incredibly – as was the case in the Great Flood of 2008 flood – no fatalities. These are amazing people in Cedar Rapids. We will be sure to recognize Mayor Ron Corbett, City Manager Jeff Pomerantz, Public Works / Emergency Operations Director Jen Winter and Carpenter’s Local 308 members from the Paramount Theatre stage during the first night of our festival to thank them for the superhuman job they did bringing the city together and saving it for our jugglers to enjoy this summer. No city is immune from disaster. Whether it’s flood, fire, tornado, hurricane, earthquake, volcano or blizzard, Nature’s immense power can test and often better the seemingly feeble defenses we humans construct. But the combined passion and effort of caring, dedicated people has, time and again, made it possible for life to go on even after such catastrophes happen. To read more about the Flood of 2016, and see photos of the incredible response the people made to save their city, visit the Cedar Rapids Gazette’s Flood 2016 page. 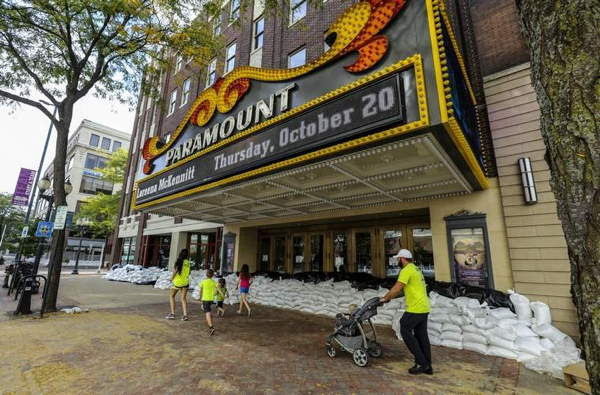 Watch a time-lapse video of the Paramount Theatre seats being re-installed after the flood. The International Jugglers' Association holds the largest week-long juggling festival in North America. The convention is held in a different city each year during mid-to-late July since 1948. Aside from the competitions, at the convention there are shows open to the public in which professional jugglers perform, and workshops are taught by jugglers of all skill levels.